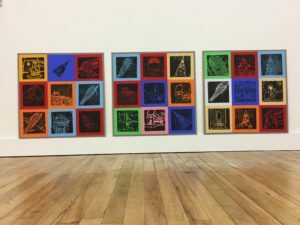 Pete Marsh Art - Printmaking > Primary School Art Workshop! 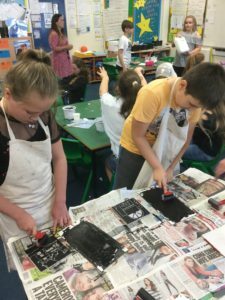 On Monday 3rd July 2017 I went to Moorgate Primary School in Bolton as part of the Fusion Art Experience. 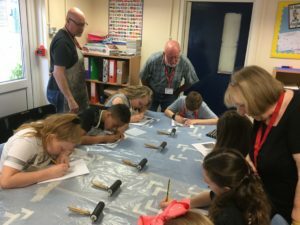 Two members of the Fusion Community Hub Art Class also came with me to offer their expertise in providing Year 6 with a Relief Printmaking experience. Mrs. M. Woods (who is also a Governor at Moorgate) and Frank helped the children throughout the day to produce work to a really high standard. Mrs. Heyes had kindly sent me an excellent range of photographs of local landmarks in or around Bolton. I then digitally “flipped” these photographs to “mirror image” or “offset” them. Once they were re-sized to match the printing plates they were printed as “greyscale” due to the children largely working in monochrome….except for the brightly coloured poster paper, of course. A considerable list of key vocabulary was written on the white board for the pupils to use as reference along with a numbered sequence for the procedure of printmaking. Working with three groups of nine at a time Marilyn, Frank and I explained to the children two different types of printmaking, namely relief and intaglio, before embarking on the practical part of the workshop. 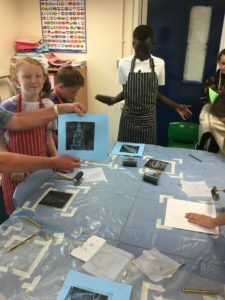 The pupils traced the “offset” photograph, transferred the tracing onto the plate, inscribed the plate, inked the plate and printed their artwork before signing it. This first print is for the School. It will form a lovely leaving present to Moorgate Primary School from Year 6 as they leave for the next part of their education at Secondary level. The second print (or impression) is for them to take home. Here we can see the children hard at work, tracing their selected part of the photograph onto tissue paper. They were so quiet you really could have heard a pin drop!!! In this photograph the girl in the foreground (bottom right) holds her pencil vertically as she transfers her tracing to the expanded polystyrene plate. Mrs. Woods looks on ready to offer technical support. In the background can be seen Frank offering advice and guidance. Frank and Mrs. Woods have experience in various printmaking techniques from my Fusion Community Hub art classes where they have produced work of an exceptionally high standard themselves. The children clearly benefited from this cross-generational experience. The pupils were very respectful and listened attentively to any helpful suggestions from Frank and Mrs. Woods. Once the plate had been inscribed with lines using a sharp HB pencil it was time to ink up the plate prior to printing. Taking care to ensure an even coat of relief ink on the plate and avoiding getting ink in the inscribed lines or “cut” areas, the pupils all made an excellent job of inking their plates. 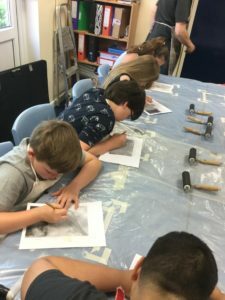 By carefully watching me demonstrate how to approach each stage of the relief printmaking process the students were able to guarantee themselves excellent results! On the right of this photograph we can see the hand of a pupil holding the paper and the plate in place making sure that there is no slippage which would cause the print to be smudged. The pupils used registration marks to ensure that the plate and the paper were correctly positioned. You can just see a roller poised above the paper about to apply enough pressure to lift the ink from the plate. Pupils had to apply enough pressure to obtain a good impression but had to be careful that they did not apply too much pressure which would damage the soft expanded polystyrene plate. Every pupil did this successfully which is testimony to their attentive listening skills and their sharp observational talents during the printing demonstration. The artworks then needed to be signed by the artists and hung to dry. 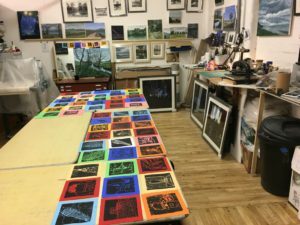 The prints were laid out in my studio on Tuesday so that I could arrange them for display. In the above photograph of my studio are the trimmed prints for display in the school along with the second impressions (untrimmed) for the children to take home. The above photograph shows the trimmed and mounted final prints displayed in the exhibition space at Falcon Mill Artists Studios (FaMAS) just prior to being delivered to Moorgate Primary School. There is some excellent work here, well done to ALL the children who took part! Frank, Mrs. Woods and I had a really enjoyable day working with well behaved and pleasant children who were clearly keen to learn new skills and eager to try something new. The quality of the work is a measure of their ability, positive attitude and hard work. In short Year 6 at Moorgate Primary School are a credit to their school, their parents and of course to themselves. Finally, big THANKS to Big Lottery Fund who provided the grant for this workshop.